Another Friday Fun Photo – Guess what happened split seconds after this photo was taken? Lots of fun – and soaking wet bodies – as camp leaders and youth splash the water around, enjoying some refreshment after an afternoon of planting trees and picking up garbage on the grounds of our host school. It was all part of a workshop on peace and the environment at last year’s peace camp. 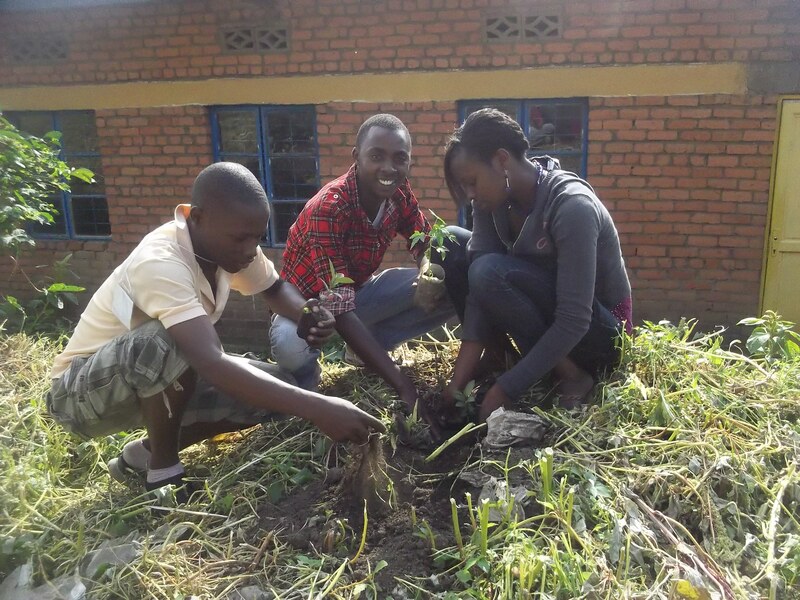 Planting trees is an important part of helping to conserve the natural, beautiful environment of Rwanda as well as replace trees used as firewood for cooking. Every November, Rwanda launches a national tree-planting campaign to encourage environmental conservation and awareness. Many youth peace clubs, including Club Unity in Mubago, are including the planting of trees in their peace-building activities. They are finding that it’s an easy and practical way to bring everyone in the village together to do a community activity as well as open a way to talk about other crucial issues they can work on together. Sometimes there is even a sharing of personal stories and an opportunity to offer forgiveness and build reconciliation among neighbours. It’s inspiring to see youth lead the way in this ground-breaking work. The peace camp is an annual event offered by A Peace of Life with local partners such as AEBR Youth. Plans are underway for Peace Camp 2012. Help sponsor youth peace-building in Rwanda by making a donation today. As part of celebrating World Water Day, we’re also pleased to present a multimedia presentation on water. It was created by youth who participated in a photography workshop at peace camp 2011. The workshop was facilitated by Johnny Lam, a professional documentary photographer who volunteers his time and expertise with A Peace of Life. Johnny has launched Gafotozi, to help empower vulnerable youth to use photography in peace-building and storytelling. Enjoy the show! Hey people – great work helping our Creator manage this beautiful earth!